First thing you have to do is check the “Anyone can Register” option under “Settings” > “General”. Don’t forget to leave the “New User Default Role” as “Subscriber”. 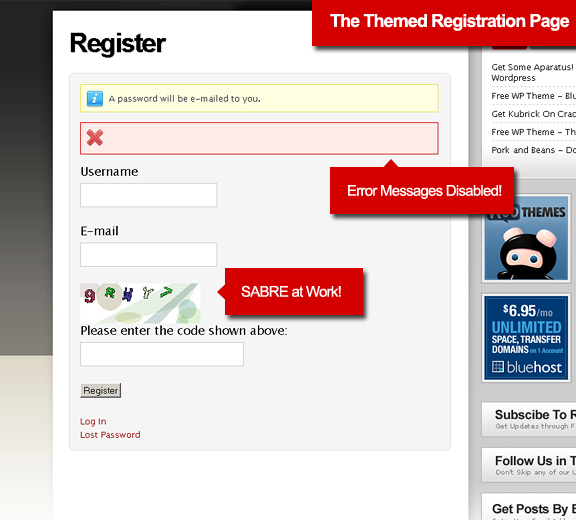 SABRE – stands for “Simple Anti Bot Registration Engine”. This produces that image during registration to block “autobots”. Limit Login Attempts – the plugin title says it all. Activate this plugin and tweak depending how tight you want login attempts. Note that you’re not going to see any error messages due to the Secure WP plugin. Theme My Login – this plugin will generate a page called “Login” – this is where your new login forms (includes new registration and forgot password) will sit. Additional options also include custom emails, redirection and moderation. *Make sure you check “Enable Template Tag” under “Optimization” – You’ll need this in your theme later. 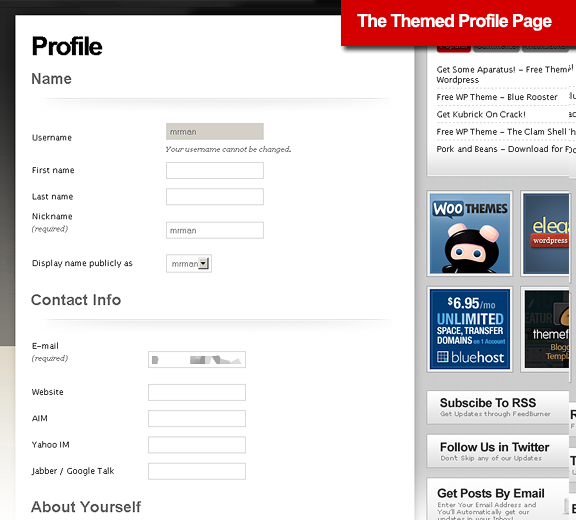 Theme My Profile – plugin created by the same author, which ports the users “profile” page into the front end. Make sure you theme and block admin area ONLY for roles you want. We’ve come to the meat of the project. This is the plugin that does all the magic. 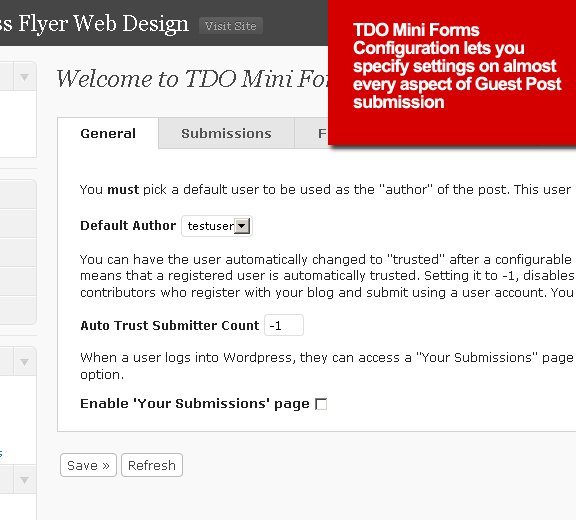 TDO Mini Forms allows users (registered on not registered) to submit and edit posts to your blog. 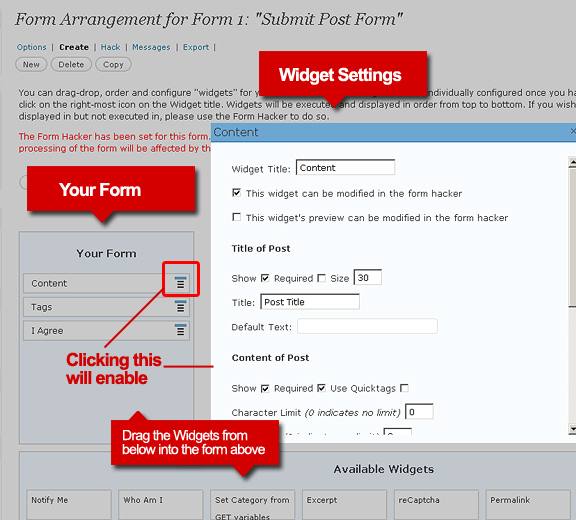 It comes with its form creator that lets you design the post submission form any way you want. Widgets that let you drag and drop components into your form, as well as a form “hacker” that allows even deeper code tweaking. What I especially liked is that it hooks up with your “Akismet” for spam protection. Now that you have converted your blog into a more automated (and sophisticated) posting process – think of all the possible scenarios you can create. Of course I’m completely aware that my guest posts will not land any successful submissions any time soon – it’s just good to know that it’s available. Not to mention, it was fun to make. Embed Videos in your Web Pages with Flowplayer! Hey, I’m following your guide to make guest posting easier on my website but the TDO Mini Forms WordPress Plugin doesn’t exists anymore. Is there any other plugin that can be used? i would like to do this on my site, but im hosted on a wordpress.com site and i dont have the very first option you mentioned on my settings (which are .org options). Is there any other way to this on a wp.com site? depends if they make the plugin for it. I want my user to upload images and embed Youtube videos in there post. Presently I have Smart tube plugin. Using that only admin can embed youtube videos. This post is useful. But the plugin is very complicated to configure. 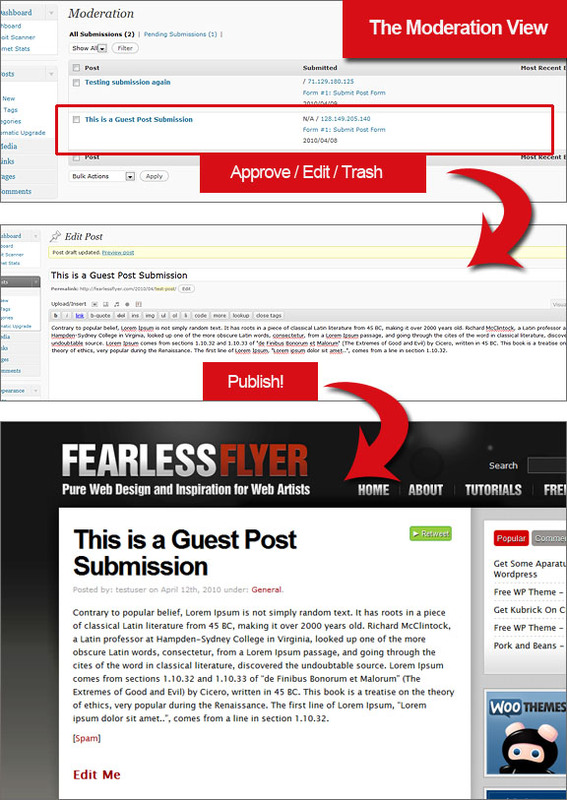 I use Content Submit plugin which has some really cool features built in specifically for guest posting. here is the url http://www.affhelper.com/content-submit-plugin/ You can even charge for post submission and it’s free too. Oh wow. That looks very useful. Thanks for sharing. thank for this post, i was searching for this type of article. I had the same idea, used Gravity Forms for a simple form that saved in the backend but I still have to copy, paste, etc. THIS, Brian is the ninja stuff. Thanks man! i’ll to try ! thanks yah…. I put on my site the theme Kubrick on crack and when I set 5 posts per page in the second page gets a blank area and if you set the settings to maximum six posts ,the area in blank is on the first page. And thanx.. for sharing with us. I have tried this on my blog but due to some error in Plugin “theme-my-profile.php” on line 367, I m not able to access my blog now. Plz help me wat to do now. I will visit again to check ur Reply. Plz Reply, Don’t del this comment. looks like you have a problem with the plugin. You might want to contact him as well. You need to go in the database and deactivate all plugins – then you should be able to access your blog again. I can see how that can be useful. Thanks for this post! It started me on the right track, but I got a problem and was wondering if anyone can help me. I want to be able to setup a custom field so that an unregistered user can fill in their name and that will be the name of the author of the post. I have searched everywhere… found this post (http://aext.net/2010/01/the-right-way-to-build-wordpress-as-a-community-news/) asked on there and my comment was moderated and removed 🙁 I couldn’t figure out how he did it, even with his instructions. He just mentioned to put in (post_author) but I had no idea where or how to do it! How can I solve this issue. I want to promote someone being able to submit a guest post and have their author name (and email too) just like comments but for a post that I can moderate. an unregistered user will not use the wp user details, therefore you need custom fields. 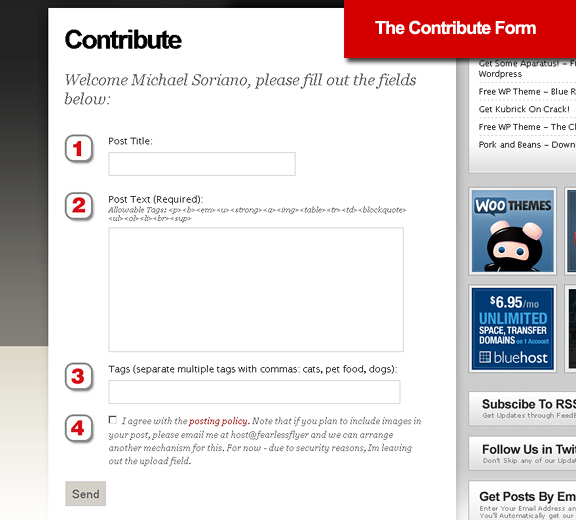 set up the fields first in wordpress – then hook these fields up in the tdo form creator (drag “custom field” from the widgets section). Be sure to allow “unregistered users” to submit entries. I suggest to play around with tdo mini forms extensively to see how much you can do. This is neat – but a question: When someone guest post (in my case, they will add their business information) – and I publish the post… can they go in later and update/edit that post? yes, it can get dangerous since you’re allowing people to submit stuff. That’s why the need for all the security plugins. Interesting… so, that’s how he does it. It’s exactly what I need for a project.